How Much Will Corporate Tax Inversions Cost the U.S. Treasury? While corporate inversions point to fundamental problems with our corporate tax system, corporate inversions are not a significant threat to the corporate tax base. 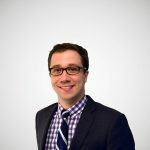 The Joint Committee on Taxation in May released their estimate of the revenue gained from passing the “Stop Corporate Inversions Act of 2014.” This law alters rules and makes it harder for corporations to invert and move overseas. The JCT estimates that this will raise approximately $19.5 billion over fiscal years 2015 and 2024. Compare this to the Congressional Budget Office’s fiscal outlook that estimates that the corporate income tax is estimated to raise approximately $4.5 trillion over the same period. 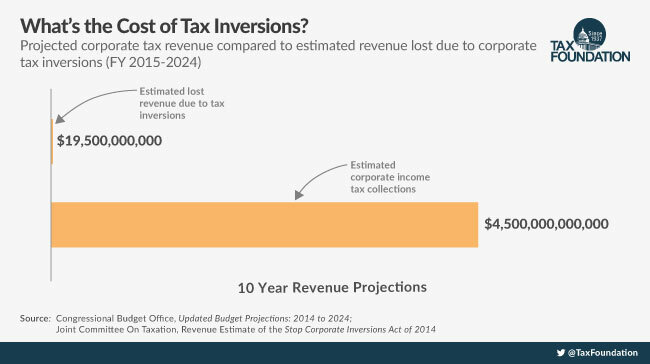 That is a 0.4 percent loss to our corporate tax base due to corporate inversions. Hardly the doom and gloom many in the press and Congress make it out to be. Why does there seems to be a great deal of hysteria over inversions when it costs so little? It is likely a misunderstanding of how the corporate tax system works. Many news reports mischaracterize an inversion as a way a corporation can escape all federal corporate income taxes. In fact, corporate inversions only work to change the taxes on the income a U.S. corporation earns overseas. The United States has what is called a worldwide tax system. This tax system taxes the income earned of corporations both here and abroad at the 35 percent corporate tax rate. First, companies operating in foreign countries pay income taxes to the country in which those profits were earned. For example, if a subsidiary of a U.S. firm earns $100 in profits in England, it pays the United Kingdom corporate income tax rate of 21 percent (or $21) on those profits. When those profits are brought back to the United States, an additional tax equal to the difference between the U.S. tax rate of 35 percent and the UK corporate rate of 21 percent ($14 in this case) is collected by the IRS. Between the two nations, the U.S. firm will have paid a total of $35, or 35 percent, in taxes on its foreign profits. An inversion only allows them to escape the additional domestic tax on their foreign earnings (the $14 in the above case). U.S. corporations will still be liable for tax on every single penny it earns in the United States. By no means are corporate inversions not a problem. Inversions point to fundamental problems with our tax code: at 39.1 percent, the United States has the highest corporate income tax rate in the developed world. Additionally, we are one of few countries that continue the practice of taxing our corporations on a worldwide basis. Inversions are a response to this reality. One thing is sure: if we do not fix our uncompetitive corporate tax system, we will continue to lose out on corporate investment.